These three complementary projects, based on the genetic and genomic resources developed during TLI (2006-2009), is developing and deploying genomic tools in molecular breeding for developing superior chickpea lines for drought tolerance in sub-Saharan Africa (Kenya, Ethiopia) and Asia (India). Large-scale SNPs in chickpea using various approaches like allele re-sequencing, sequencing of transcritome etc ( Plant Biotechnology Journal (2012) 10, 716–732 ). Cost-effective and low to mid throughput SNP genotyping platforms such as 2005 KASPar assays, 768-SNP assay for GoldenGate assays and 96-SNP assay for BeadXpress system. Genome-wide physical map in collaboration with National Institute of Plant Genetic Research (NIPGR), New Delhi and University of California -Davis, USA (http://probes.pw.usda.gov:8080/chickpea/). Introgression of a genomic region harboring various drought tolerance related QTLs contributing >30% phenotypic variation in some elite cultivars from Africa and Asia in collaboration with Egerton University (EU) – Kenya, Ethiopian Institute of Agricultural Research (EIAR) – Ethiopia, Indian Institute of Pulses Research (IIPR) – India, Indian Agricultural Research Institute (IARI)- New Delhi. Deployment of marker-assisted recurrent selection (MARS) approach for pyramiding drought tolerance alleles in collaboration with EU, EIAR, IARI and IIPR. Organization of a workshop on modern breeding technologies for chickpea improvement (October 25 – November 19, 2010; ) in which sixteen chickpea scientists from both TLI and TLII initiatives as well as others, twelve from Africa (Ethiopia, Kenya, Tanzania, Malawi, Algeria) and four from Asia (India, Nepal, Bangladesh, Myanmar) participated. Training the next-generation of breeders by hosting PhD and MSc students from Africa: Ms Serah Songok (EU, Kenya), Mr Musa Jarso (Addis Ababa University; AAU, Ethiopia), Ms Alice Koskie (West Africa Centre for Crop Improvement; WACCI, Ghana), Mr Kebede Teshome (Haramaya University; HU, Ethiopia), Mr Abebe Sori (HU, Ethiopia), Mr Moses Oyier (EU, Kenya), Mr Getachew Tilahun (AAU, Ethiopia). The project is deploying molecular markers to develop the superior lines of chickpea with enhanced resistance to fusraium wilt (FW) and also ascochyta blight (AB). ICRISAT has been leading these efforts with four other collaborating centres Jawaharlal Nehru Krishi Vishwa Vidyalaya (JNKVV), Jabalpur; IIPR, Kanpur; Mahatma Phule Krishi Vidyapeeth (MPKV), Rahuri and ARS-Gulburga. C 214 genotype has been selected to pyramid resistance to race 1 and race 3 of FW and two QTLs for AB by using two donor genotypes namely WR 315 (for FW resistance) and ILC 3279 (AB resistance). Two crosses C 214 (FWS) × WR315 (FWR) and C 214 (ABS) × ILC 3279 (ABR) have been made and BC3F3 progenies have been developed from each of two crosses by deploying foreground and background selection. Marker genotyping for crosses developed at ARS-Gulbarga and MPKV-Rahuri is in progress. Under IGSTC, ICRISAT in collaboration with University of Frankfurt (Germany), GenXPro (Germany) and BenchBio (India) is developing tools for molecular breeding such as the Illumina BeadXpress arrays, validated gene expression microarrays, qRT-PCR assays, high-density gene-based expression marker maps, eQTLs and candidate genes/QTLs associated with drought related traits. Use of these tools in chickpea breeding programs should eventually lead to development of chickpea varieties with enhanced drought tolerance that will enhance chickpea production in drought prone environment. RNA-seq approach is being used on drought stressed root tissues of two chickpea genotypes, ICC 4958 and ICC 1882, parents of a mapping population segregating for drought tolerance were selected along with 5 best RILs each from tolerant and sensitive sets based on selective phenotyping. Reference set comprising of 300 lines have been genotyped with DArT and KASPar assays and association genetics approach for mapping drought tolerance trait is in progress. RAD-Sequencing of 48 genotypes is underway. In collaboration with University of California- Davis (USA),The goal of the project is to characterize the genetic mechanisms that underlie phenotypic plasticity for symbiosis through elucidating the molecular genetic basis of phenotypic variation for symbiotic nitrogen fixation efficiency in Cicer spp, including C. ariteinum (cultivated chickpea) and C. reticulatum (the wild progenitor); to quantify the impact of domestication on the potential for symbiotic nitrogen fixation in chickpea; to examine genetic potential for efficient nitrogen fixation in chickpea. To understand the genetic bottleneck of domestication in chickpea, 18 cultivars and 12 wild accessions, were analyzed in field trials to phenotype in no treatment, rhizobium and nitrogen treatment. To evaluate the effect of drought stress on symbiotic nitrogen fixation a gradient of chickpea genotypes including 4 species arietinum, reticulatum, echinospermum and bijugum were exposed to terminal drought stress. 13 genotypes were subjected to irrigated and stressed conditions under 3 treatments viz. no treatment, nitrogen and rhizobium treatment. Phenological parameters such as shoot biomass, root biomass, nodule weight, nodule number and leaf surface area were recorded to elucidate the elevation of stress effect on tolerant and susceptible genotypes. Genetic diversity present in elite gene pool is being utilized by linkage mapping and nested association mapping (NAM) approaches for trait mapping. Multi-parents advanced generation inter-cross (MAGIC) population and introgression libraries (ILs) are being developed to generate genetic resources with enhanced genetic diversity after bringing the superior alleles from landraces and wild species, respectively. Superior alleles for traits of interest to the breeders, present in un-adapted germplasm (e.g. reference set), are being identified through genome-wide association study (GWAS) approach. Genetic material, available at present and being developed, will be used for multi-location phenotyping for traits of interest to breeders and will be used for high-density genotyping (e.g. GBS). Detailed analysis of these large-scale data should provide useful information on marker(s)/ gene(s)/ haplotype(s)- trait association as well as the superior lines for target traits as well as with enhanced genetic diversity that can be used in future molecular breeding programmes. It is believed that determinate growth habit has long been selected during pigeonpea domestication and some of the mutation may be responsible for this transition from indeterminate to determinate growth habit. 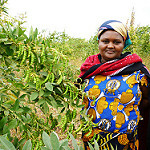 Keeping the above in view efforts have been made to identify the genes responsible for this transition in pigeonpea. Both genome-wide association analysis and candidate gene based approaches were employed to identify candidate markers and SNPs responsible for determinacy in pigeonpea. For genome-wide association analysis, GoldenGate assay (768 SNPs) by Illumina and 15,360 features developed by DArT Pty Ltd, Australia was used. For candidate gene sequencing, a set of 12 candidate genes were initially selected from Kwak et al. 2008 (J Heredity 99: 283-291). Association analysis using the TASSEL program showed significant (p= <0.01) association of determinacy trait with 19 SNP and 6 DArT markers explaining 8.1-8.6% and 7.3-14.5% of phenotypic variation respectively. One SNP identified in TFL1 showed the strongest association with determinacy, flowering time and plant height. Two candidate genes, GI and TFL1 were mapped to LG7 and LG4 of ICPA 2039 × ICPL 2447, F2 mapping population where the growth habit phenotype segregates. Terminal drought has high adverse impact on yield worldwide in groundnut. Identification and development of tolerant/resistant breeding material is one of the challenging objectives in groundnut breeding. Two genetic linkage maps based on two RILs namely ICGS 76 × CSMG 84-1 and ICGS 44 × ICGS 76 were constructed with 82 and 188 marker loci, respectively. A consensus genetic map with 293 SSR loci (2,840.8 cM) were prepared for drought tolerance related traits based on three RILs (TAG 24 × ICGV 86031, ICGS 76 × CSMG 84-1, ICGS 44 × ICGS 76). Identification of a total of 153 main effect QTLs (M-QTLs) and 25 epistatic QTLs (E-QTLs) for drought tolerance related traits. Sixteen key genomic regions were selected on the basis of QTLs identified for their expected role towards drought adaptation. (Molecular Breeding (2012) 30, 757-772). Development of reference consensus maps using marker segregation data for 10 RILs and one BC population from the international groundnut community comprising 897 marker loci spanning a map distance of 3863.6 cM with an average map density of 4.4 cM (PLoS ONE (2012) 7, e41213a>). Integration of available genomic tools for genetic enhancement of cultivated groundnut in collaboration with several international partners (Biotechnology Advances (2012) 30, 639-651). Rust, caused by Puccinia arachidis, is widespread in most of the tropical countries and severely affects the crop productivity and quality of the groundnut seed/oil. Despite the fact that several fungicides are available to control, host-plant resistance is considered as the best approach to manage this disease and to overcome hazardous effect of fungicides. Furthermore, since the trait is governed by recessive genes, use of tightly linked markers will enhance precision in selection of the trait as well as shorten the breeding duration. Tightly linked SSR markers for rust resistance using a RIL population (TAG 24 × GPBD 4) was identified and validated among a diverse set of germplasm and alternate mapping population (TG 26 × GPBD 4). Successful marker-assisted introgression of major QTL (QTLrust01) into three elite cultivars (TAG 24, JL 24 and ICGV 91114) using the donor (GPBD 4). Identification of several promising lines based on initial screening for rust resistance showing remarkable reduction in disease spread. Groundnut (Arachis hypogaea L.) is a major oilseed legume crop in India as meets >30% of the edible oil requirements. Newer groundnut varieties with oil content (OC) and oleic/linoleic acid ratio (O/L ratio) higher than that of the varieties currently cultivated by farmers are needed to boost the edible oil production and correspondingly increase the income levels of the poor groundnut farmers. The project aims at improving the quality and quantity of groundnut oil employing molecular breeding approaches. Crosses were made to develop mapping populations to identify QTLs for high oil content (OC) and oleic/linoleic acid (O/L) ratio. Linked markers i.e., cleaved amplified polymorphic sequence (CAPS) and allele-specific PCR-based markers reported elsewhere were validated among a diverse set of 22 parental genotypes. The existing genotyping protocol has been modified to amplify these markers and to get clear separation of alleles. The validated markers for O/L ratio using modified protocol are being used currently for introgression of high oleate trait through marker-assisted backcrossing (MABC) in the genetic background of elite high OC groundnut cultivars.